I always worry when new books are compared to bestsellers with a cult-like following. After all, shouldn’t writers strive to find their own voices and be proud of them? So when I saw a blurb comparing Arwen Elys Dayton’s newest book Seeker to Game of Thrones, The Hunger Games, and Divergent, I had the sinking sensation that a lot of readers would be disappointed by the literary world’s version of false advertisement. Comparisons like these tend to make readers form preconceived notions about what they’re about to read. I start reading each and every book with an open mind and try to review accordingly. Unfortunately, there were too many flaws for me to overlook, and as a result I’ve stopped reading Seeker midway. The story started out strong and captivating. I wanted to know more about the three young warriors and their quest to become seekers. The problem is, I was halfway through the book and still didn’t know what a seeker was. Or what time period the story was set in. And while the characters started off strong, they became more shallow and unbelievable with every new page. Their relationships to one another felt forced. As I read farther, things just stopped fitting together. There were too many unanswered questions, and while I’d like to believe that the ending ties up some loose ends, I was too frustrated to try and get there. I loved the concept of Seeker, but this just didn’t work for me. Disclaimer: I received an uncorrected proof of this book through the publisher. I am not being compensated in any way for this review. All of the opinions expressed here are my own. I hate to give negative reviews of anyone’s published work. I know the amount of effort that goes into writing and the sting of rejection that comes with it. Unfortunately, no matter how much I’d love to give every book I read a raving review, I would much rather be honest. 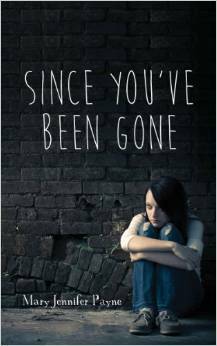 The back matter for Mary Jennifer Payne’s new young adult book, Since You’ve Been Gone, intrigued me. Edie and her mother are on the run. Things seem to be going well after their sudden move to London until Edie’s mother disappears. Now Edie is on her own and can’t run to the police for help. Despite its interesting subject matter, I was disappointed. Payne uses mostly simile when giving any kind of description, but the similes are not very original or interesting. They’re also quite frequent, and at some points are found in every other sentence. They throw off the flow of the story rather than add to it. The story as a whole, strangely, is both rushed and slow moving at the same time. The overall plot did not move fast enough to keep me entertained; I was halfway through the book and still had no information as to why they were running or why I should care about Edie’s life. On the other hand, smaller events in the book happened so quickly that they felt unrealistic. I really disliked Edie as a character. So much so that I couldn’t connect to the story. Her inconsistencies made it hard for me to believe anything about her. Actually, I would love to see all of the characters in the book developed more fully. So, overall, this one’s a no for me. The concept had great potential, but the execution left something to be desired. Of course, that’s just my personal opinion. There are plenty of positive reviews for Since You’ve Been Gone floating around, so give it a shot if this hasn’t deterred you. Writing fiction is hard work. The same rules we’re told to follow are also rules we’re told to break. We have the task of creating complex plots and even more complicated and believable characters. Sometimes writers nail this formula. Many don’t, at least not on the first try. It’s a learning process. Maybe I’ll review Payne’s next book sometime in the distant future, and I’ll be pleasantly surprised when she blows me away.